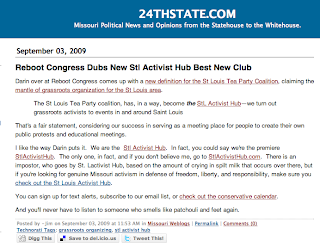 Is the St. Louis Tea Party Misreporting Another Altercation? UPDATE: Yes, it looks like they are. 1. The teabaggers crossed over and were on the pro-healthcare reform side of the road when the incident happened. 2. McCarty's video is clearly highly edited and full of McCarty's attempts to create a narrative for the incident. If anyone is expected to take it seriously, McCarty should release his full, unedited video from the day's events. 3. McCarty is a highly questionable source of information. He publicly entertains the idea that the Oklahoma City bombing was actually a plot by Muslim extremists and that the government is covering this fact up. 4. 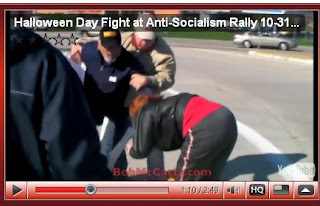 Even McCarty admits that the teabagger pulled the woman to the ground. Of course, none of these consdierations would cause the tea party's opportunistic leaders to hesitate for even a second about declaring it a "union attack!" But the rest of us will keep an eye out for more information. Teabaggers crossed the road and tried to provoke us. They had video recorders and wanted us to throw the first punch. Didn't work - so one of their guys (carrying an anti-Obama sign) grabbed a woman from our ranks by the throat and punched her. Prince of a man. He was detained. Cops arrived and all those video recorders were gone. Imagine that. Charges filed. Monday, Oct. 26, Connect 4 is hosting a discussion of socio-economic diversity on the WashU Campus from noon to 1 PM in the DUC commons on campus. Also Monday, there will be a meeting on the WashU campus to discuss how to respond to the recent racial discrimination incident at a Chicago Bar where several black students were denied entry into a bar because they had "baggy jeans" while white students with similar clothes were allowed in. The students held a protest the next day, but are looking into how to continue their campaign. The meeting will be from 8 to 10 PM at LabSci 300 on the WashU campus. Also Tuesday, ReVitalize St. Louis is hosting a workshop on Green Rehabbing at the Landmarks Association of St. Louis (911 Washington, Suite 170) from 7 to 9 PM. Wednesday, Oct. 28, the YWCA (2711 Locus St.) is hosting a discussion On Common Ground about the relationship between African Americans and Jews from 5:30 to 7 PM. Also Wednesday, MO Department of Agriculture Director Jon Hagler is the speaker at the Holden Public Policy Forum's Pizza and Politics discussion in the Sunnen Lounge at Webster University (175 Edgar Road) from 6 to 7:30 PM. Also Wednesday, Metropolitan Congregations United is hosting a Jammin' for Justice Fundraiser from 6:30 to 9:30 at the Schlafly Tap Room (2100 Locust). Featuring Hudson and the Hoo Doo Cats. Also Wednesday, the West County Democrats are hosting a screening of Life on the Edge of a Bubble + a discussion with the filmmakers at UFCW Local 655 (300 Weidman Rd., Ballwin) at 7 PM. Also Wednesday, Sister Helen Prejean will discuss her book Dead Man Walking and experiences ministering to death row inmates at the Immaculat Conception Catholic Church (2300 Church Rd. in Arnold, MO) at 7 PM. Also Wednesday, the Schlafly Bottleworks (7260 Southwest Avenue) is hosting WashU Psychology Prof. Randy Larsen for Mirth Busters: Facts and Fictions of Happiness from 7 to 8:30 PM. Thursday, Oct. 29, there will be a presentation and lecture on the Bosnian genocide at room 200/201 of the Student Center of the Meramec Campus of the St. Louis Community College from 11 AM to 1 PM. Also Thursday, St. Louis Mayor Slay is speaking on urban issues in St. Louis at the DUC Commons on the WashU campus from 5:30 to 8 PM. Also Thursday, award-winning author Keith Boykin will be speaking on Being Black and Gay in America from 6 to 7:45 in McDonnell 162 on the WashU campus. Also Thursday, there will be a discussion of Michael Moore's Capitalism: A Love Story at the Carpenter Branch Library (3309 S. Grand) from 6 to 8 PM. Also Thursday, Drinking Liberally St. Louis City is meeting up at the Premium Lounge (4199 Manchester) at 6:30 PM. Also Thursday, there will be a Take Back the Streets panel discussion on violence at Seigle Hall room L003 on the WashU campus from 7 to 9 PM. Also Thursday, the Community Arts and Media Project (CAMP) is holding a brainstorm/potluck from 7 to 9 PM at 3022A Cherokee. Thursday and Friday, the Center for the Humanities at UMSL is hosting a "What is a City?" conference with loads of interesting speakers and panels. Friday, Oct. 30, the Pulitzer Foundation is holding an opening for artist/urbanist/social activist Gordon Matta-Clark from 5 to 9 PM at 3716 Washington Blvd. As part of the exhibit, the foundation will also be holding panel discussions about neighborhood revitalization later on. Also Friday, Black Bear Bakery, a local worker-owned collective, is hosting the May Day Orchestra for a performance of their 2nd Folk Opera from 8 to 9 PM at 2639 Cherokee. Also Friday, Pride St. Louis is hosting a Hell on Heels Halloween costume competition and fundraiser at Attitudes Nightclub (4100 Manchester) from 11 PM to 3 AM. Saturday, Oct. 31, activist and State Representative candidate Stacey Newman is holding a Halloween rally at the Shaw Park North Pavilion (10 S. Brentwood Blvd) from 9:30 AM to noon. Also Saturday, MoKaBe's is hosting a Dia de los Muertos SAMBA d'ESQUELETOS from 11 AM to 5 PM to raise money for Leonoar Peltier's defense fund and fro the Word in Motion Slam poetry programs for St. Louis City schools. They're also asking people to bring canned foods. There will be poetry, painting and much more: check out this link for the full details. Also Saturday, Ken Haller is having a Halloween/Birthday party that also raises money for PROMO at 4146 Flora from 6 PM to midnight. Sunday, Nov. 1, the Jewish Fund for Human Needs is holding a book fair fundraiser from 10 AM to 9 PM at Borders in Breentwood (1519 Brentwood Blvd.). 15% of purchases at Borders will support the cause. Also Sunday, the Center for Theology and Social Analysis is having their own discussion of Michael Moore's Capitalism: A Love Story at 1077 Newstead from 1 to 2:30. Monday, Oct. 19, a personal care item drive is beginning at the George Warren Brown School of Social work and continuing until Nov. 1st. The items will be given to the Harvey Kornblum Jewish Food Pantry, which serves over 3600 individuals per month. There will be collection bins in Goldfarb and Brown Halls on the WashU campus. Tuesday, Oct. 20, is the National Health Care Reform Day of Action. Several groups around town will be holding signs and banners at busy intersections from 7 AM to 9 AM and from 4 PM to 6 PM. Find out more about the locations here; or sign up for the facebook group of the Skinker and Forest Park Parkway event here. Also Tuesday, there will be a pro-healthcare reform rally outside of Senator McCaskill's office (5850 Delmar) from noon to 1 PM. Also Tuesday, the Literacy for Social Justice Teacher Research Group will be holding a "Banned Book Event" at Legacy Books and Cafe (5429 Delmar) from 1 to 3 PM. The theme is "Voices Silenced and Voices Mandated in the Classroom." Also Tuesday, St. Louis County Council candidate Terri Williams is holding a Tuesdays with Terri meet and greet at CJ Muggs Restauraunt (101 West Lockwood in Webster Groves) from 5:30 to 7:30 PM. Wednesday, Oct. 21, Left Bank Books current affairs reading group will be discussing Paul Krugman's Return of Depression Economics at 399 Euclid from noon to 1 PM. Also Wednesday, the Way Out Club is hosting a tour stop put on by the HEN Foundation, a group that supports progressive artists/activists, featuring Colleen Kattau, Koji, and "None for Me." The event will be from 8 PM to midnight, at 2525 S. Jefferson. Thursday, Oct. 22, there will be a benefit dinner for the Animal Protection Association (ironically?) at Jim Edmonds Steakhouse at 1900 Locust Avenue. Also Thursday, as part of the Controversy 'n Coffee series on the WashU campus, there will be a discussion of socioeconomic diversity at WashU from 5:30 to 6:30 PM in the DUC Commons. Also Thursday, the Coalition Against Police Crimes and Repression (CAPCR) is participating in the National Protest Against Police Brutality from 7 to 8:30 PM at the Julia Davis Branch Library at 4415 Natural Bridge. Also Thursday, the Missouri History Museum (Lindell and DeBaliviere) is hosting a film about Human Rights in Haiti at 7 PM in the Lee Auditorium. Friday, Oct. 23, Greater St. Louis NORML is holding a Marijuana Legalization Protest from 4 to 7 PM at the Missouri History Museum, 5700 Lindell. Also Friday, the long awaited return of the MetroLink Prom is back! This year's theme is "Enchanted Ride," which sounds quite prom-y. They'll be meeting at 7:30 at the Forest Park Parkway metrolink platform (but check back at the link for precise details). Along the way, they'll elect a prom king and queen, slow dance, line dance, and take prom portraits. It's a pretty awesome way to show your support for public transit! Also Friday is the Young Democrats of Greater St. Louis Halloween Party at the Glaziers Union Hall (5916 Wilson Ave.) from 7 to 10 PM. Saturday and Sunday, 8 AM to 8 AM, PASTE, South City Studio, and Girls Guide to the Galaxy are holding a 24 hour needle event, Needles for Newborns, to benefit the St. Louis Children's Hospital. PASTE is located at 1009 Russell Avenue in Soulard. Also Saturday (Oct. 24) is Kirkwood Make a Difference Day from 8:30 AM to noon. Check here for details. Also Saturday is the Zombie Squad Blood Drive at the St. Louis Police Association Hall (3710 Hampton) from 11 AM to 4 PM. They want your BLOOD! You should click the link if only to see their awesome picture! www.350.org/actionatthearch get a free shirt. Sunday, Oct. 25, and every Sunday, the Instead of War Coalition will be holding a Candlelight Vigil for Peace at the corner of Grand and Lindell. Monday, October 12, Straights and Gays for Equality (S.A.G.E) is hosting a screening of Milk at the DSAC Caf' at Fontbonne from 7:30 to 10:00 PM. Also Monday, the WashU Co-op has it's weekly open mic night at 6021 Perhing from 8:30 to 10 pm. Monday through Wednesday, the Sheldon Concert Hall is hosting Breakfast in Bed: the Voices of Domestic Violence at 7:30 PM nightly. Tuesday, Oct. 13, will be the first of several meetings for long-range planning meetings for Metro. The event will be at the World Trade Center in Clayton from 5 to 7 PM. Also Tuesday, the WashU Peace Coalition is hosting a discussion on the question, "Why are we in Afghanistan?" Dr. Canfield of the Anthropology Department will provide a 30 minute overview of the current situation and will be followed by an extended period of Q&A and discussion. The event is at 7 PM in Eliot 102. Also Tuesday, Landmarks Association will be holding a class on state and federal tax credits from 7 to 9 PM at 911 Washington, Suite 170. Wednesday, Oct. 14, the Gay-Straight Alliance at SIUE is holding a Die-In to raise awareness of people killed in hate crimes at the Quad on the SIUE campus starting at noon. Also Wednesday, the WashU Peace Coalition will be hosting Frida Berrigan, an expert on nuclear and conventional arms control, for a talk. She'll be speaking in Crow 204 on the WashU campus from 7 to 8:30 PM. Thursday, Oct. 25, Jackson Katz, an internationally recognized expert, will be speaking about gender violence prevention at the Leadership Center in the Spellman Campus Center at Lindenwood University, 209 S. Kingshighway (in St. Charles), from 7:30 to 10 PM. Friday, Oct. 26, is the first day of Power Shift 09, a statewide conference being held at SLU for those interested in passing a strong clean energy bill. The conference lasts until Sunday, and should have great training sessions and workshops for anyone interested in activism. Also Friday, the Catholic Action Network is holding a Women Led Prayer session at 3832 Botanical, from 6:30 to 8:30 PM. Also Friday is the Fourth Annual AmeriCorps St. Louis Trivia Night raising money for a great cause. The event will be at the Heights in Richmond Heights (8001 Dale ave.), starting at 7 PM, and there will be unlimited beer, soda, and light snacks. Tables are $20 per person; call 314-772-9002 for more info. Also Friday, arms control expert Frida Berrigan will be speaking at the St. Louis Ethical Society, 9001 Clayton, from 7 to 9 PM. Ms. Berrigan was invited to St. Louis by the Peace Economy Project, and this should be a great talk! Also Friday, the Flax Gallery is holding a Save the Girls art exhibit to raise money for Breast Cancer Awareness month. The gallery is located at 1214 Washington and the show runs from 7 to 11 PM. Saturday, Oct. 17, the St. Louis Art of Living Society is holding a Take Action Against Poverty event at the Maplewood United Methodist Church (7409 Flora) from 4 to 5 PM. Sunday, Oct. 18, the Community Arts and Media Project (CAMP) is hosting an interactive art experience called Art meets the Street at 3022 Cherokee from 1 to 3 PM. Check out the subtitle on the right: "Americans for Prosperity protest latest attempted grab by government." Yeah, framing health care reform as a "grab by the government' is totally objective. Honestly, our local paper is owned by a neocon. If progressives don't figure out a new way to deliver our own media, we're going to be screwed. Monday, October 5, St. Charles County Organizing for America group will be phonebanking for health care reform from 6:30 to 9 PM. Also Monday, listen to Joel Salitin's perspective on our industrial food system at the University Center Gymnasium on the Webster Campus (175 Edgar Rd.) from 7:30 to 9:30 PM. Also Monday, take part in an important and fun fundraiser for a bus trip to the March for Equality in Washington D.C. this weekend. The organizers of the trip are making sure that no one will be turned down for lack of funds, and you can help! Performer Dieta Pepsi will be hosting "Homo Bingo" at Just Johns (4112 Manchester) from 9 PM to 1 PM and the suggested donation is only $5. Please contribute to a movement whose time is now! Tuesday, Oct. 6, The Burning Kumquat, WashU's community garden, is hosting a Farm Party with Mollie Katzen, author of the Moosewood Cookbook. The event will be at the Garden on Wallace Drive from 4 to 8 PM, and will feature an iron-chef style cookoff. Also Tuesday, there's another great benefit for the bus trip to this weekend's D.C. rally. This benefit at Nancy's Place (4510 Manchester) features local celebs Dieta Pepsi, Trish Busch, Ed Reggi and John Kinney. There's an early 9 PM show, and a 10 PM show that will also feature Lola Van Ella! Wednesday, Oct. 6, a group of progressives is meeting for a casual lunch. For more details, check out the first comment below. Also Wednesday, the Women's International League for Peace and Freedom (WILPF) is hosting "Israeli-Palestinian Peace: Possibility or Dream?" at the University City Library (67-1 Delmar) from 7PM to 8:30 PM. Also Wednesday, this month's Black and Green Wednesday put on by the Gateway Greens will be focused on a recent ACLU report that documented Abuse in the St. Louis Correctional Centers. The event will be at Legacy Books (5429 Delmar) from 7 to 10 PM. Thursday, Oct. 8, Women's Voices Raised is hosting a discussion titled, "Disparities in Health Care and the Challenge of Covering Everyone" with Dr. Ross, the Associate Dean for Diversity at the Washington University Medical School. The event will be at the Ethical Society (9001 Clayton Rd.) starting at 6:30 PM. Also Thursday, St. Louis NORML will be meeting from 7:15 to 9 PM at Mokabe's on the corner of Grand and Arsenal. Friday, Oct. 9, The Gay-Straight Alliance at SIUE is celebrating Coming Out Day on the Quad from 10 AM to 2 PM. Also Friday, the St. Louis Young Dems are hosting a Blues Brothers Birthday Bash for Alderman Lewis Reed at the Glaziers Union Hall (5916 Wilson) from 5:30 to 8:30 PM. Friday and Saturday, the LGBT Center of St. Louis is hosting a Purple Hand Queer Youth Leadership Summit open to everyone 13-25. The event will feature workshops on LGBT History, Politics, and Organizational Structure, as well as lunch, dinner, and a movie screening. Saturday, Oct. 10, is the first day of the National March for Equality in Washington D.C., led by Harvey Milk's close friend Cleve Jones. There's a large contingent of people going from St. Louis, and you can join as well (there are still about 5 seats left on the bus I'm told). Also Saturday, the Proposition One Nuclear Disarmament Tour, a nationwide grassroots movement, will be at the Carpenter Branch of the St. Louis Public Library (309 S. Grand) starting at 3 PM. Also Saturday, NARAL is holding a "Fabulous at Forty" fundraiser from 6:30 to 10:30 PM at Crowne Plaza Clayton, 7750 Carondelet. Also Saturday, Carrie Newomer is coming to St. Louis to perform at a benefit concert for the Center for Social Justice at Saint Louis University. The event will be at Tegler Hall on the SLU campus (3550 Lindell) at 7:30 PM. Sunday, Oct. 11. The St. Louis Instead of War Coalition will be marking the 8th anniversary of the war in Afghanistan with a special event "Afghanistan: 8 Years of War. End it Now!" at the corner of Lindell and Grand from 7 to 8 PM. It's no surprise that writing material that takes on the local tea party movement is going to attract some odd responses. I've gotten used to the bizarre comments and emails that come in as a result of my analysis of the tea partiers and in particular of their exaggerated and blatantly false claims. But one dude, local blogger Jim Durbin, has been strange above all the rest. I originally was planning on ignoring him, but since he just can't seem to quit pestering me, I've decided that it's probably a good idea to systematically document all of his bizarre behavior. It starts out pretty mild, so skip the first couple of paragraphs if you want to see the really weird stuff. In what seems like eons ago, I wrote a post deconstructing the right-wing claim that a particular video showed that "SEIU thugs" had been sent to a Carnahan event to beat up protesters. In the comments of my post, Jim Durbin showed up and started arguing that the videos were all after-the-fact (contrary to what the right-wing bloggers originally claimed) and that the truth would really be revealed once the police reports came out that next week, just I wait and see (BTW, the reports have still not yet been released). Though he and I disagreed, the conversations were civilized. Durbin made a number of mistakes in trying to understand what I was saying, but at least he wasn't resorting to childish name-calling or bizarre attempts at intimidation. 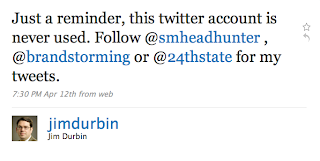 That all changed after I answered a challenge that Durbin had put forward about the incident. 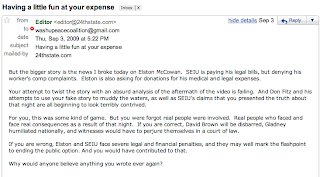 He had written a blog post claiming that we could determine whether Elston McCowan (one of the central SEIU members involved in the scuffle) or David Brown (the "lawyer" representing Kenneth Gladney in the incident) was lying by looking at the button board Gladney was using. McCowan had claimed that the board had pictures of Obama smoking dope; Brown told Durbin that it didn't. So Jim Durbin's hypothesis was that if we could find a picture of the button board, we could determine who was lying. I found a picture of the board, and demonstrated that David Brown was misleading Durbin. Rather than simply admitting that his challenge had been met (though it initially seemed like he was going to), Durbin snapped and started acting in the bizarre ways that are the subject of this post. Durbin's first freak-out came when I posted a diary about what happened in the aftermath of the incident at McCaskill's Hillsboro town hall where a teabagger grabbed a Rosa Parks sign out of the hands of Maxine Johnson. I posted video from outside of the event of other teabaggers immediately assuming that the entire incident was Johnson's fault, and I stated that they were blaming the victim. Durbin invented a story that I somehow claimed that one of the teabaggers in the video had told Johnson's friend to "shut up," but it's clear from my post that I said nothing of the sort. I merely pointed out that they were blaming Johnson without knowing the details of what happened and that they completely ignored the fact a man illegally ripped a sign out of her hand. But far be it from Jim Durbin to pay attention to the actual language I used rather than his own invented delusion. His bitterness over the Gladney incident had apparently put him in a rage, and he began a bizarre Twitter tirade where he first called me an "Idiot"
and then proclaimed that he had decided to drop, "all pretense of civility," with me. When I asked him to back up his claim that I was "dishonest," he ignored me. All of this simply because I had posted a video showing the behavior I observed with my own eyes. and mysteriously referred to me as "their wannabe puppet king." *24thstate <http://twitter.com/24thstate>*to be clear - if pictures of kids, homes, jobs or personal details are exposed on a site related to you, we will return the favor en masse. Given that Durbin is obviously quite comfortable with his business clients knowing about his extreme right-wing views, I had no idea what his strange threats were all about. However, I wasn't paying much attention to it, since I really was not that interested in engaging with him in the first place. I thought that if I just ignored his weird threats, he would eventually leave me alone. Durbin states, apparently for no reason, that "this is a game to you," and signals that his intent is to make sure that no one believes anything I write ever again. Even more crazily, he suggests that I personally will be responsible if the public option fails. Apparently this is the case because my questioning the Gladney story awoke the sleeping tiger of Jim Durbin, who did some investigative reporting and came to the amazing conclusion that, wait for it, an SEIU employee works for SEIU!!! Durbin apparently literally believed that this revelation was enough to kill the public option. So not only do I have a bizarre stalker, but he's a guy with delusions of self-grandeur as well. Great. Even so, I was still willing to ignore all of this, since as I said the domain name doesn't really affect me. But I got online a couple days ago and found that, lo and behold, Jim Durbin just can't seem to quit me. He wrote, in response to a Riverfront Times article that showed that David Brown is indeed the huckster I claimed he was, that I am "not to bright" and that he's "disgusted" by my behavior. "Here I analyze the video that is the tea baggers' primary evidence, and argue that it seems perfectly consistent with SEIU's story, and rather inconsistent with Gladney's story." But of course evidence "being consistent" with a story doesn't entail that story is true. The fact that David Brown was selling buttons at the event is consistent both with the right-wingers' story and with SEIU's story, but obviously doesn't entail that both are true. My point was that the video did not contradict the claim that Gladney assaulted McCowan; but that is not the same thing as saying that Gladney did assault McCowan. On the other hand, the video did look like it's inconsistent with the claim that several people were standing around Gladney and beating him. Not exactly declaring that I know exactly what happened, am I? Yet Durbin invented in his mind that I am somehow spinning an elaborate tale of what happened that night, and he declares that I'm a "liar" based on his own delusions. Of course, what I actually said was, "there were well over 500 pro-reform people there (my best guess was 800 to 1000)" so Durbin is blatantly lying yet again. 5. Repeatedly makes threats about "releasing names and addresses." I honestly would be quite happy to never have to write about Jim Durbin again. But if he's going to continue making passive-aggressive threats and pestering me, then I feel an obligation to document his weird behavior.